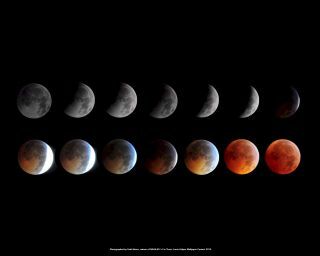 An unusually long total lunar eclipse will occur as the moon turns full tonight (June 15) for skywatchers across parts of South America, Europe, Asia, Africa and Australia. At its peak, the total eclipse of the moon will last 100 minutes, making it the longest lunar eclipse in 11 years. The eclipse will not be visible from North America, but observers across a wide swath of the Eastern Hemisphere have a chance to see the lunar event. The lunar eclipse will begin about 1:24 p.m. EDT (1724 GMT) and last until 7 p.m. EDT (2300 GMT). The eclipse's peak will occur at 4:12 p.m. EDT (2012 GMT). For observers in South America, western Europe and the west coast of Africa, the eclipse will be visible this evening. Skywatchers in eastern Brazil, Uruguay and Argentina will be able to see the eclipse’s total phase, according to a NASA alert. According to the website Spaceweather.com, which monitors space weather and skywatching events, the recent eruption of the Puyehue-Cordón Caulle volcano in Chile may also have an impact on the moon’s look tonight. "Exhaust from the erupting volcano in Chile could alter the appearance of the eclipse," the website stated. NASA eclipse experts have said the entire lunar eclipse will be visible from eastern Africa, the Middle East, central Asia and western Australia, though skywatchers in Europe will miss the beginning of the event because the moon will still be below the horizon. If you plan to observe or photograph the total lunar eclipse of June 15 and would like to share your comments and images with SPACE.com for a possible story or image gallery, contact Managing Editor Tariq Malik at: tmalik@space.com. This NASA chart lists the start, peak and end times for the June 15, 2011 total lunar eclipse as well as likely visibility regions of the world. There is more to the full moon of June than just tonight’s total lunar eclipse. When the moon rises across North America around 9 p.m. local time, it will be just a few hours past the instant of full moon, which occurs at 4:14 p.m. EDT (2014 GMT), the exact time when the sun, Earth, and moon fall in a straight line. It is at that time when much of the Old World will experience the lunar eclipse at that time. This month's full moon is also unusual for another reason. In addition to coinciding with a lunar eclipse, the June full moon falls very close to the summer solstice on June 21, the date when the sun rides highest in the sky in the Northern Hemisphere. Since the moon is directly opposite the sun at full moon, this means that the moon is close to its lowest possible position in the sky. Just as the midsummer sun leads to the longest day in the year, the midsummer moon is above the horizon for a shorter time than any other full moon in the year, approximately nine hours at middle latitudes. The accompanying chart shows the full moon as it will appear at midnight in the mid-southern United States. It will be bracketed by two zodiacal constellations, Scorpius and Sagittarius. Rather than showing the fanciful figures of these two traditional constellations, the chart shows two more mundane asterism patterns: a fish hook instead of Scorpius, and a teapot instead of Sagittarius. June’s full moon is called the "flower moon." It is directly opposite the Sun, close to the summer solstice, so is the "lowest" full moon of the year, rising in the southeast around 9 p.m. and setting only 9 hours later around 6 a.m. Under a "Flower Full Moon"
There are traditional names for all the full moons in the year. The full moon of June is known as the "flower moon," because many flowers are in bloom at this time of year. The Algonquian language calls it the strawberry moon. Some other names are honey moon, rose moon, hot moon and planting moon. An unusual feature of all full moons is that they mark the only night in the lunar cycle when the moon is in the sky all night long, and is completely absent from the daytime sky. Many people have the mistaken belief that the sun and moon are always opposite each other, and that the moon shines all night long every night of the month. This simply is not true. Because the moon is in orbit around the Earth, it can only be exactly opposite the sun one night a month, the night of full moon. During the rest of the month, the moon spends some time in the daytime sky, which means that it also must be absent from the nighttime sky by a corresponding amount of time.